Travel Talk Tours do excellent value group tours in a number of countries around the world, and it seemed like a fun and easy way to meet some new people, experience some new countries, and find some exciting things to take pictures of. 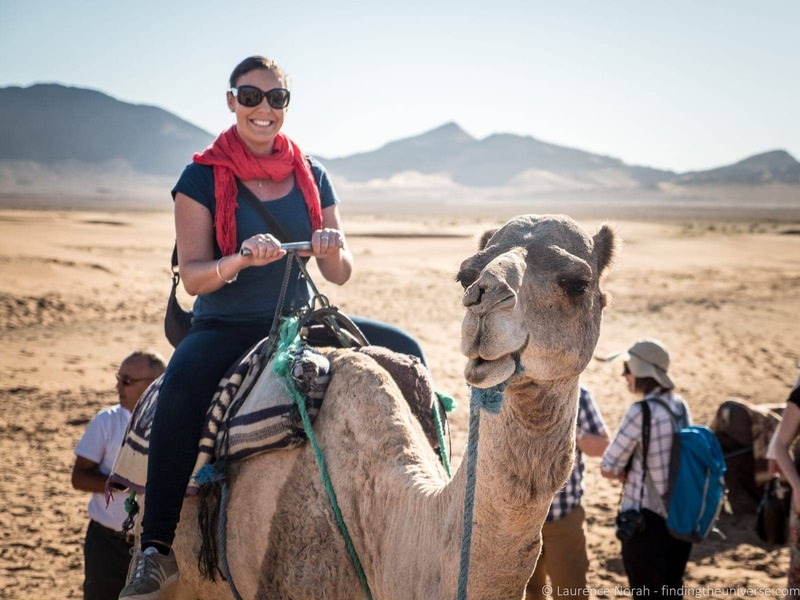 The first trip we did was the 10 day “Exotic Morocco” tour, billed as the best way to experience the highlights of the country, from the medinas of Fez and Marrakech, to the beach of Essaouira, through to camping under the stars and camel riding in the Sahara desert. That’s a lot to take in, and a lot of ground to cover, with the desert and wilderness parts being what I was most looking forward to. So what was our experience with Travel Talk Tours? 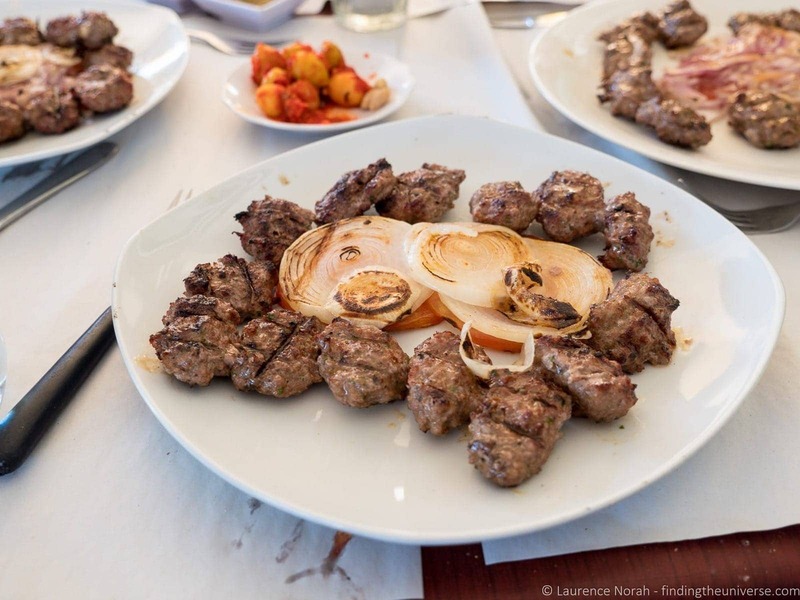 Read on for our full review of our Travel Talk Morocco tour! You can also see more photos from this tour (if there aren’t enough in this post!) in this photo essay I did. 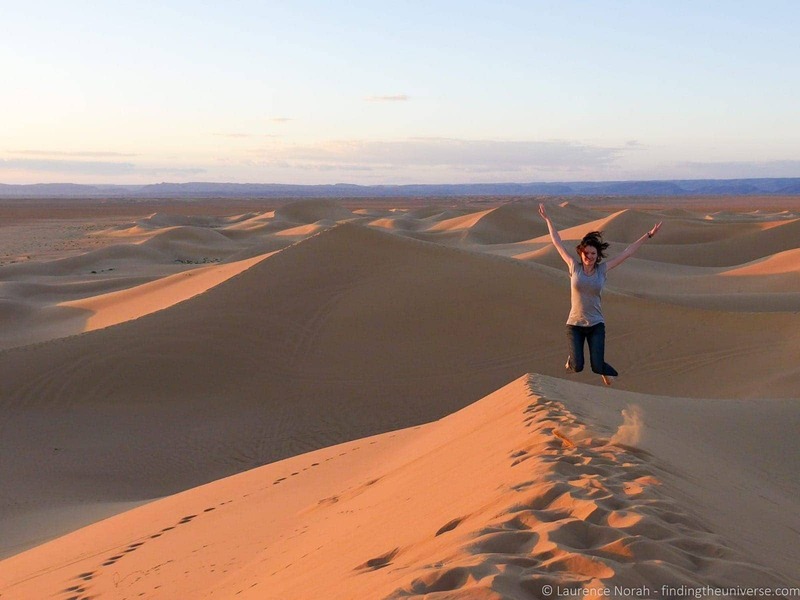 Travel Talk Tours review: What was good about our Morocco Tour? Travel Talk Tours review: What wasn’t so great? Who’s going to be on a Travel Talk tour like this? 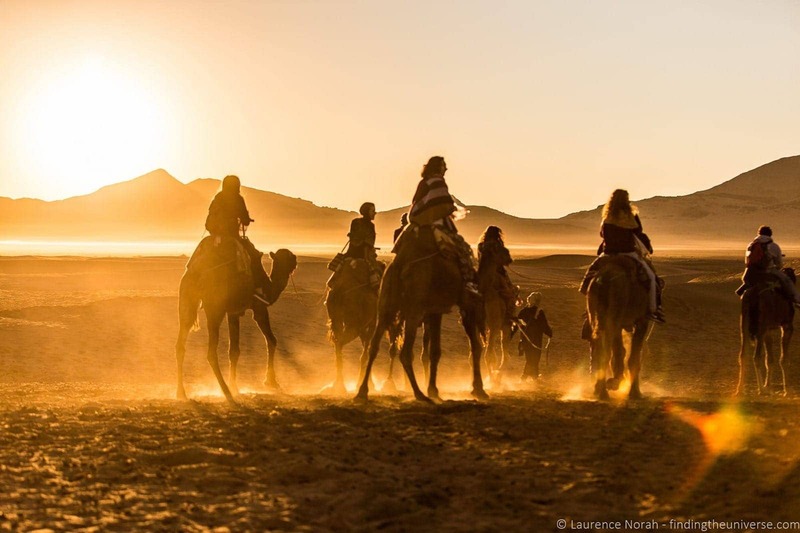 What do you need to know about travelling in Morocco? 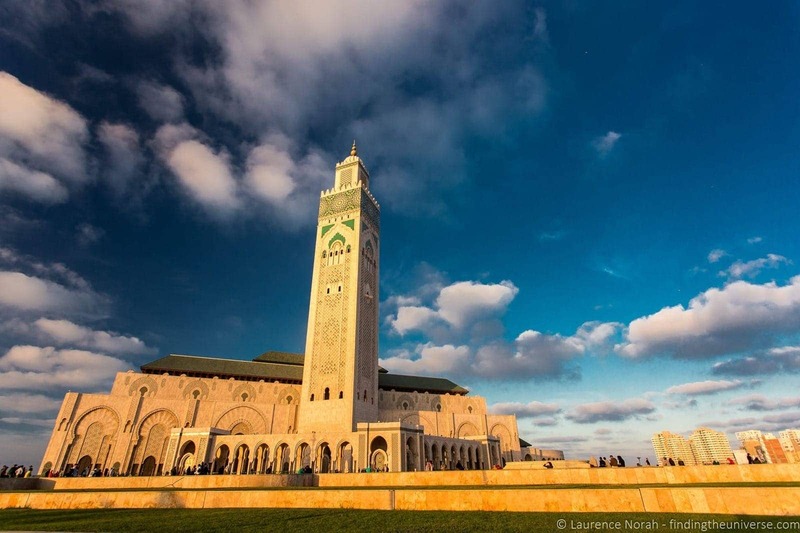 Is a tour of Morocco with Travel Talk Tours for you? 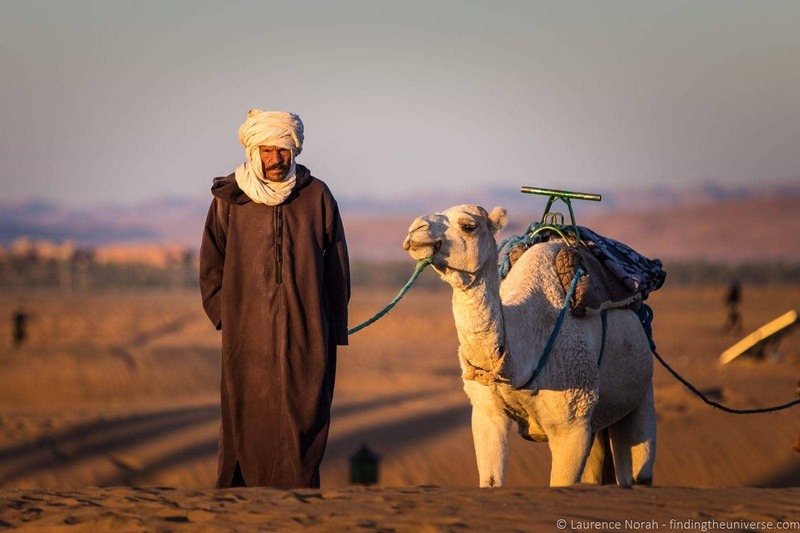 This post outlines our experiences and review of our Travel Talk Tours Morocco Tour. 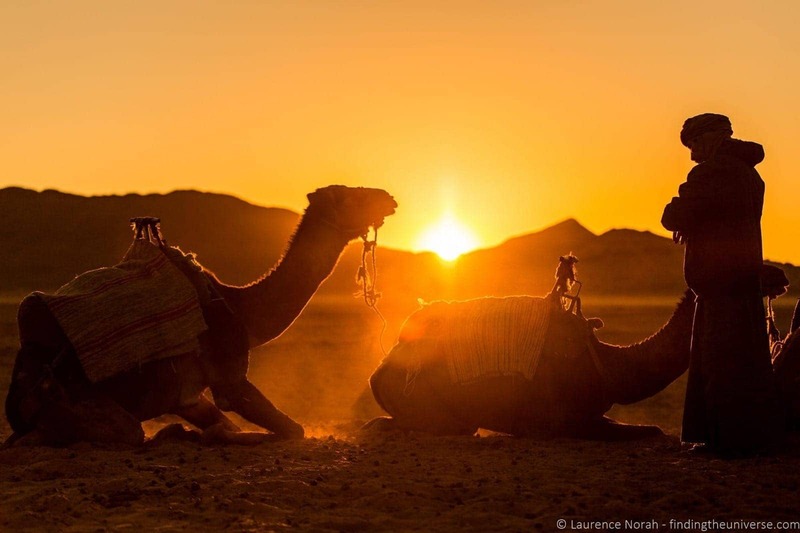 This was a 10 day Morocco tour, covering many of the highlights of Morocco over the 10 day itinerary. 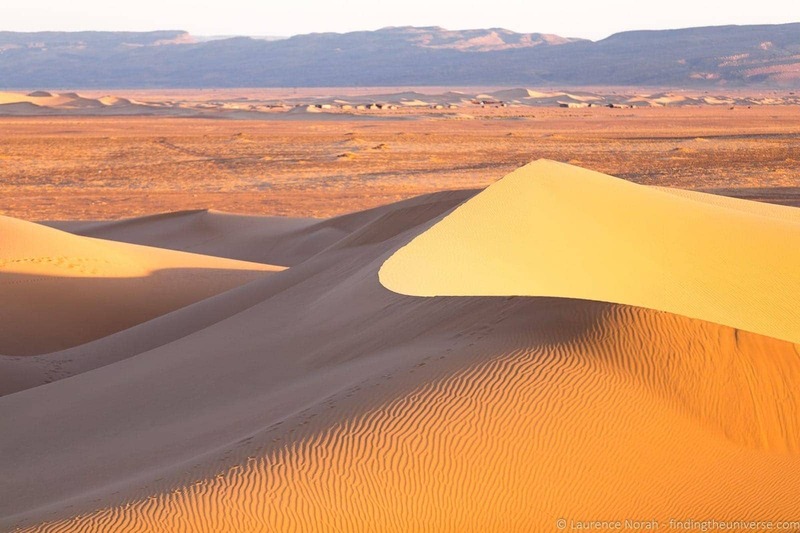 If you wanted to travel for a shorter time, Travel Talk have a number of Morocco tours on their website here. I’d actually spent eight days in Marrakech prior to the tour starting, so had fairly comprehensively visited all the sights. This was a good thing, but the first day was really just about meeting the rest of the group and having an evening briefing. Our guide let us know how to get into the old city from our hotel (about 3km away), but no formal activities were arranged. 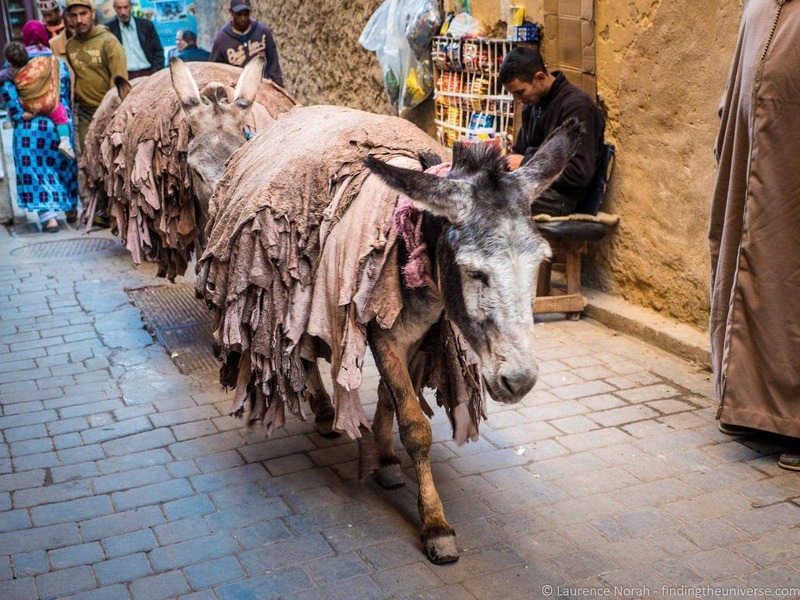 If you are interested in sight-seeing in Marrakech, this excellent post has you covered. The adventures on the bus begin! You’re going to notice there’s a lot of time spent on the bus. On our tour, this was a comfortable bus that could seat around 22 people, and as there were only 16 of us, most people got two seats. That’s not standard of course, but it did make the trip fairly comfortable. 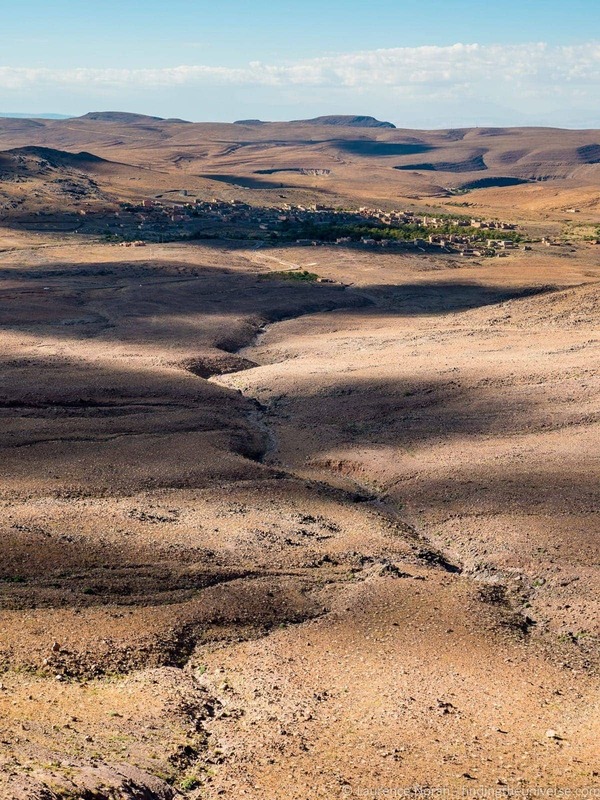 Our trip took us from Marrakech to Zagora, a journey that required crossing the Atlas mountain range, which divides the country. These are a gorgeous mountain range, and the drive through them was filled with jaw dropping scenery. The tour stopped a few times on the way for bathroom / drink / snack breaks, and we had a longer stop for lunch. Lunch stops on the tour were always optional, in that you didn’t have to go to the recommended restaurants, but everyone did because it was generally the easiest (and sometimes only) option! Finally, after a full day of driving, we got as far as the bus could go, and walked the last section to the desert camp as the sun was setting. Here we had a full meal, music by firelight, and tented accommodation under the stars. 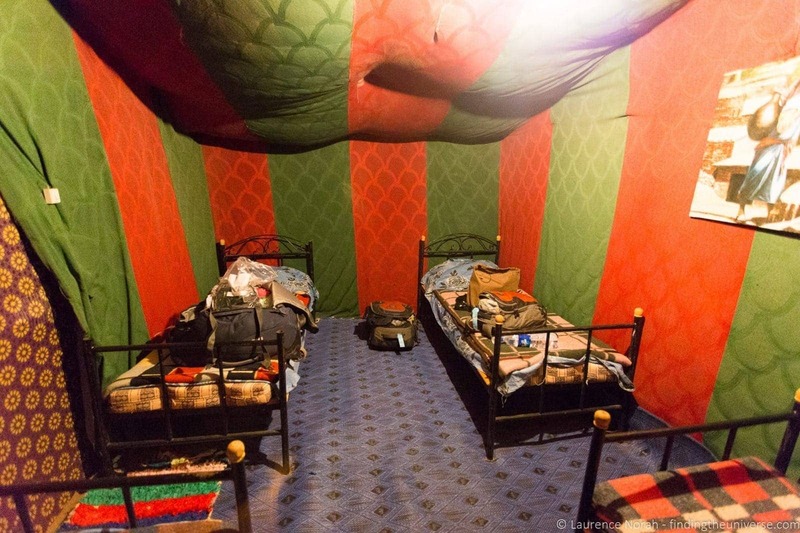 In this case, the accommodation was fairly basic, with four beds per tent, although everything was clean and well maintained. The food was excellent, and we had a really nice evening with everyone. The day started early – I wanted to catch the sunrise – so I was out of bed by 6am. 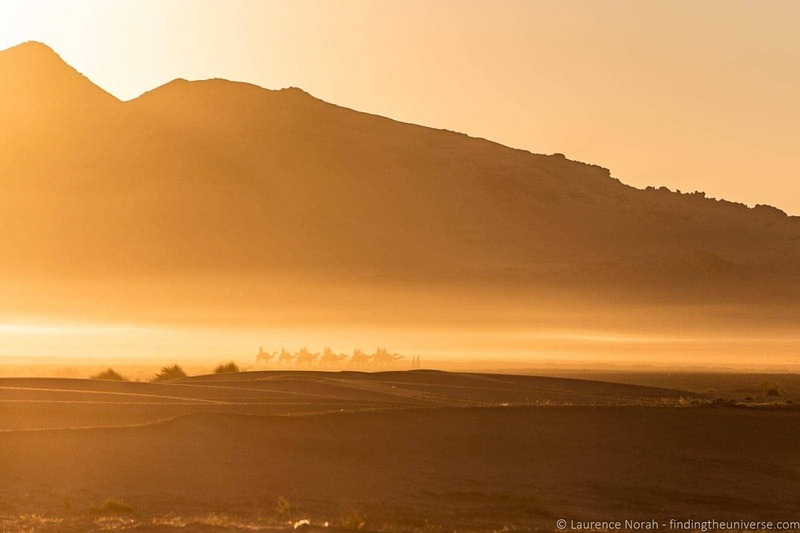 Conveniently, a whole pile of camels were collected just behind the tents, which made for some photogenic scenes as the sun rose over the sand dunes. Then, after breakfast, it was time for a two hour ride on a camel in the desert! I’m not going to lie, riding a camel isn’t exactly a comfortable affair. For the first ten minutes it was tremendous fun. Then you realise that the seat isn’t so comfortable (you try putting a seat on a hump), and you’re going to be stuck up here for another hour and fifty minutes, and it becomes more of an endurance test. Ok, so I may be exaggerating a little. It was definitely an experience. Jess actually decided to walk her camel rather than ride it and just walked along with the guides and helped direct the camels which was perhaps the smarter idea. From the camel riding we hopped into a collection of 4×4’s. I was particularly excited to be in a Toyota Landcruiser, which took me back to my year’s Australian exploration. Having an actual padded seat was also a bonus after two hours on a camel. Our first stop was a village which makes pottery, and we had a nice tour of the pottery making, followed by the option to buy some pottery. This was a really nice experience, and there was no hard sell at all, just the opportunity to buy some pottery if you wanted. 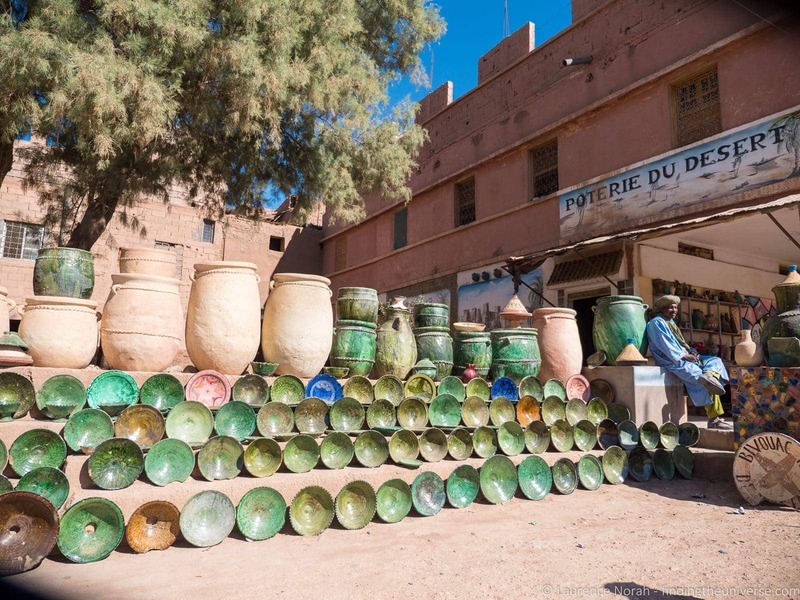 It was really nice pottery, so a lot of folks invested in tagines and tableware, which were at quite reasonable prices. 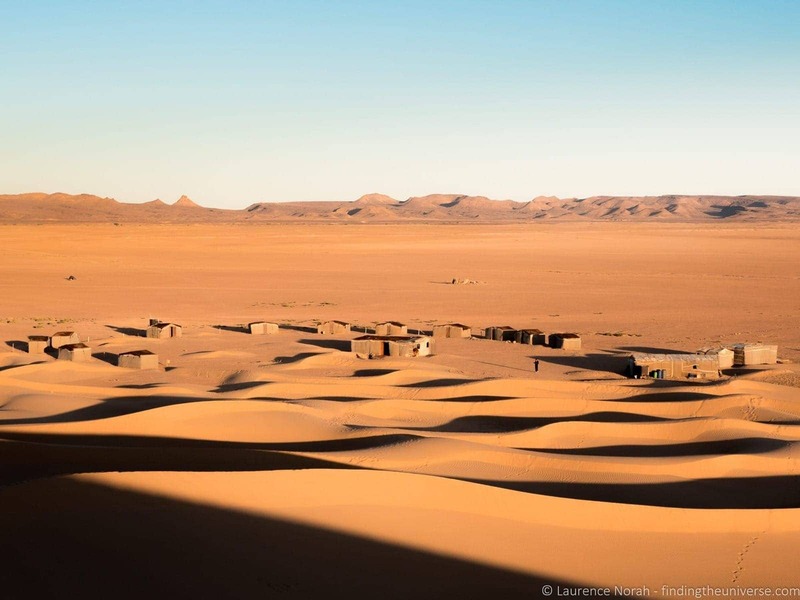 Then, on again, this time, into the edge of the Sahara proper – hence the 4×4’s! We had a brief stop for lunch, which involved a large picnic rug under some palm trees, and then drove into the desert. If you’ve never ridden a jeep in the desert, you’re in for a treat, this is a load of fun as these vehicles show off what they can do in the sand. We stopped by a huge dune from where we had a gorgeous view of the sunset, before heading to another desert camp under the stars. 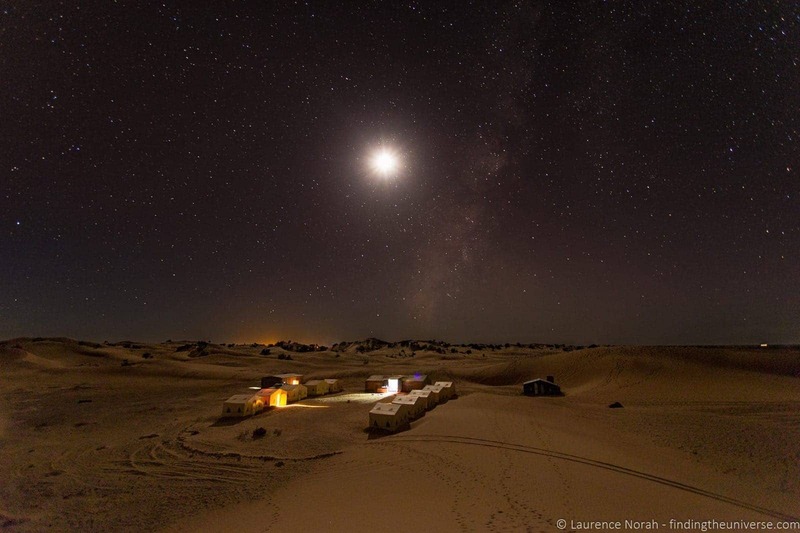 I very much preferred this second desert camp. 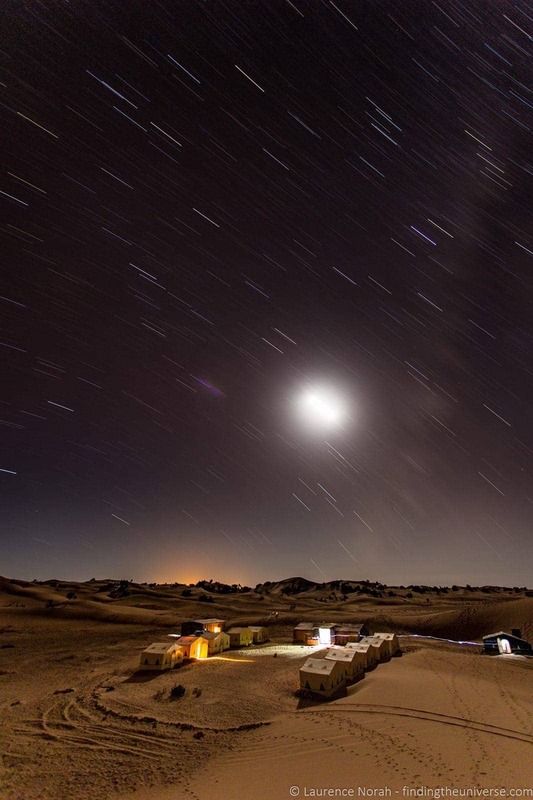 Surrounded by huge dunes and with a gorgeously clear sky, it was perfect for star gazing and a spot of astrophotography. Plus, music and drinks by the campfire, not to be sniffed at! 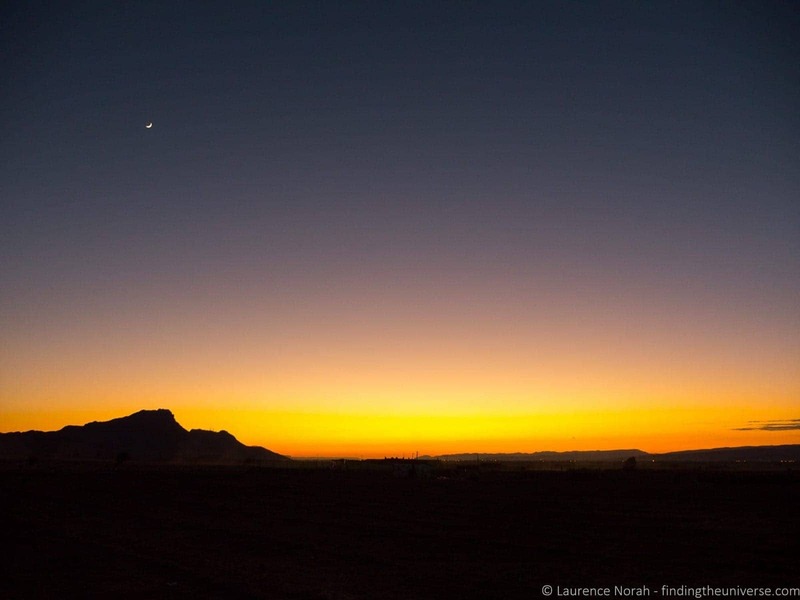 After another early start (you can’t miss the opportunity to shoot a sunrise in the Sahara! ), we had another decent breakfast and it was onwards to Tinghir. 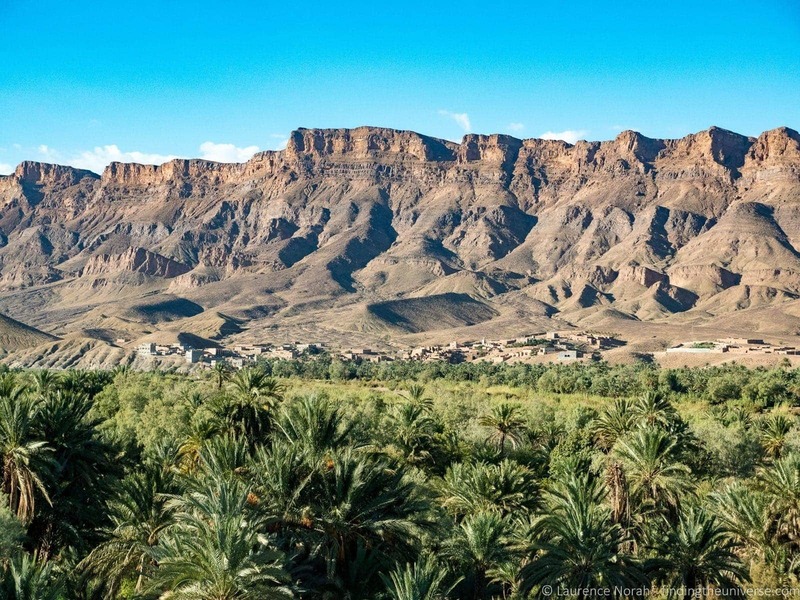 If you look at a map of Morocco, you’ll notice that Tinghir is about a five hour drive from Mhamid, which is the town on the edge of the desert, and we were an hour and a half’s drive inside the desert. So, you guessed it, another full day on the bus. Again, the scenery was pretty epic, and there were plenty of stops for photos, bathroom breaks, snacks and so on, so this wasn’t a problem. 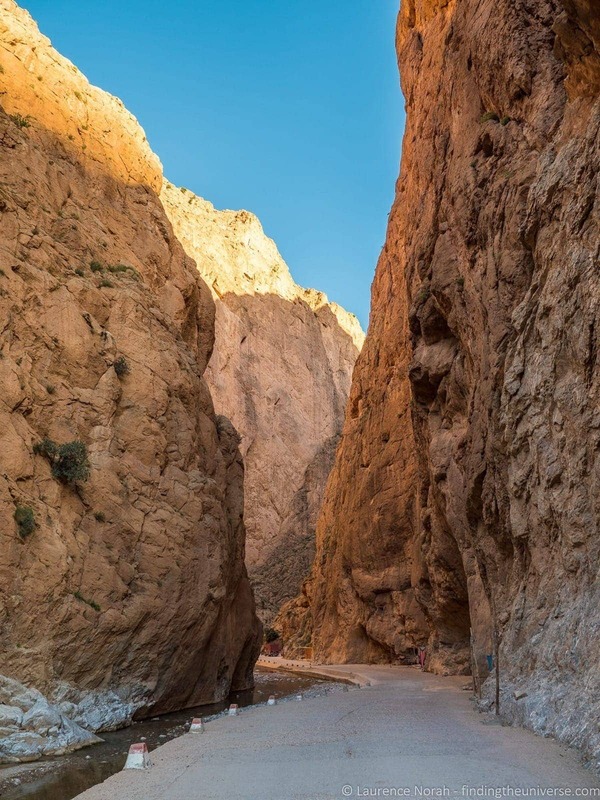 The highlights of this day (other than that gorgeous sunrise), was the trip up into Todgha gorge, a fantastic canyon in the eastern part of the High Atlas mountains, with walls that tower up to 160m on either side. It’s very popular with hikers, and a really worthwhile place to visit. Then, we drove into Tinghir and spent the night in a hotel with lovely panoramic views over the city as the sun set. Our fifth day was another day of driving. Morocco is a fairly well spread out country, so a lot of transportation seems inevitable. The good news is that we had two nights scheduled in Fez, which meant a whole day of exploration was to come. In the meantime, it was a full day on the bus, enjoying the scenery of the Atlas mountains, again with lots of short breaks. The highlight of this trip had to be the stop for the monkeys. I mean, who doesn’t like monkeys? 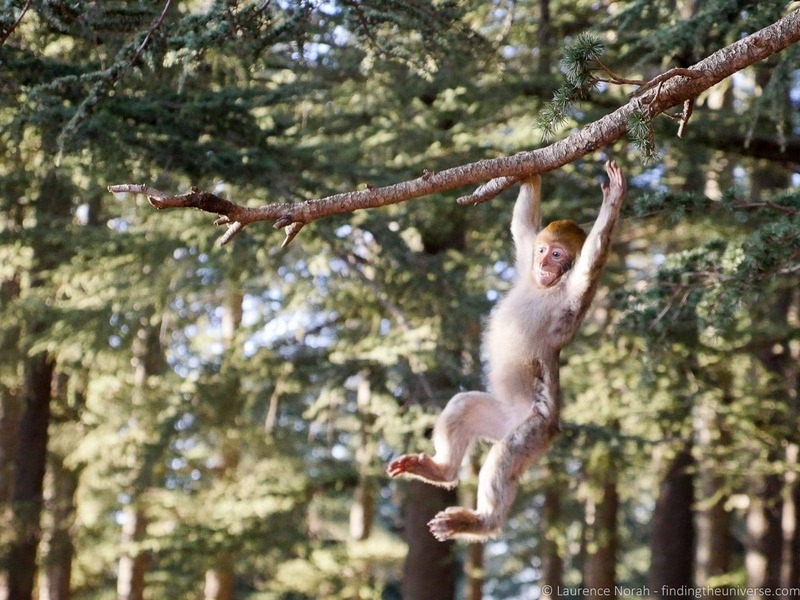 (Sorry if you don’t like monkeys). We paused for at least a half hour in a lovely wooded area where we watched monkeys of all sizes playing in the trees, swinging from branches, and generally having a good old monkey time. 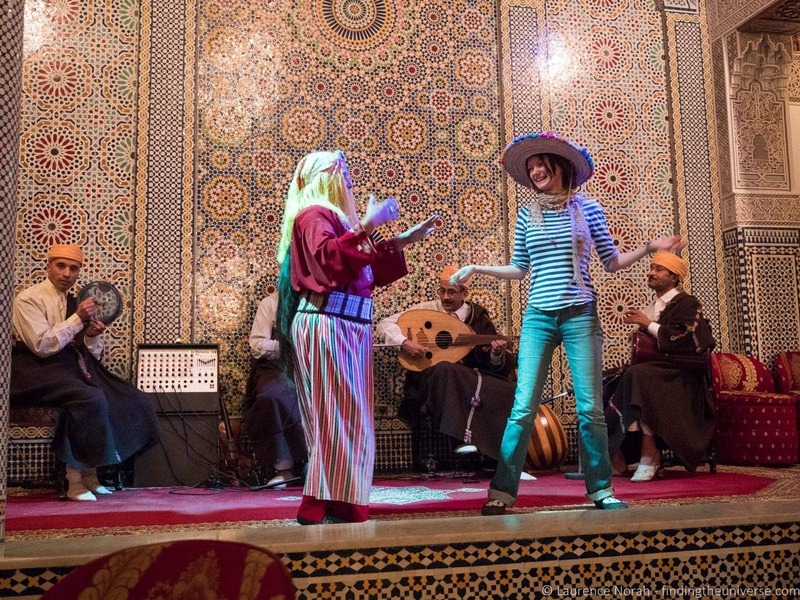 Then, it was into Fez, where we checked into a lovely hotel, and had the option of an evening entertainment performance (extra fee). This involved a short bus trip into the centre of the city, and an evening of dinner and entertainment. This included music, belly dancers, and a magic show. It was also very interactive, with everyone ending up on stage at some point. The food was tasty, and everyone had a great deal of fun. 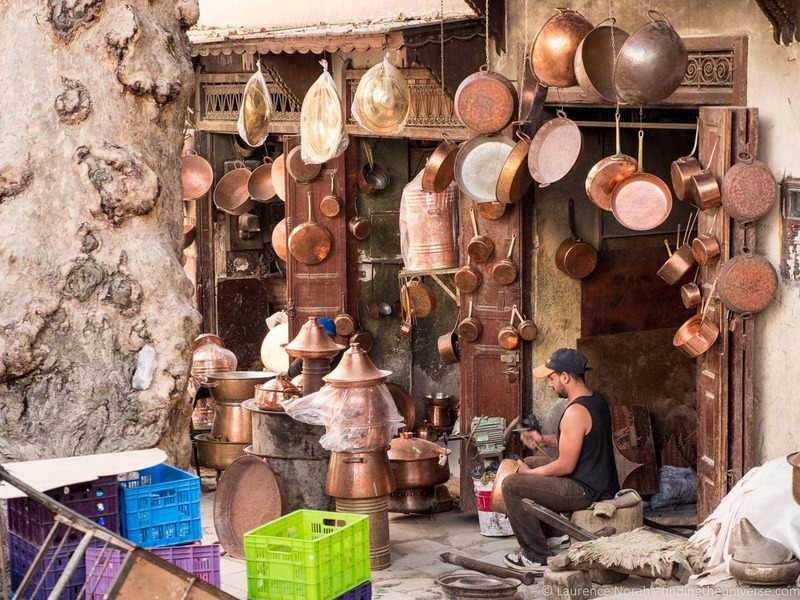 Fez is home to the oldest university in the world, and the old medieval market, or medina that makes up the heart of the old town centre, has roots reaching back to the 9th century. So it was no wonder that it’s a UNESCO listed site, or that our tour would have us spending a full day here. This involved a guided tour of the medina which lasted a few hours, with a local guide. We were led through the maze that is the medina (I would have been totally lost within moments on my own! ), who showed us all sorts of interesting stalls where the locals come to do their shopping, as well as some of the highlights of the medina including that ancient university. 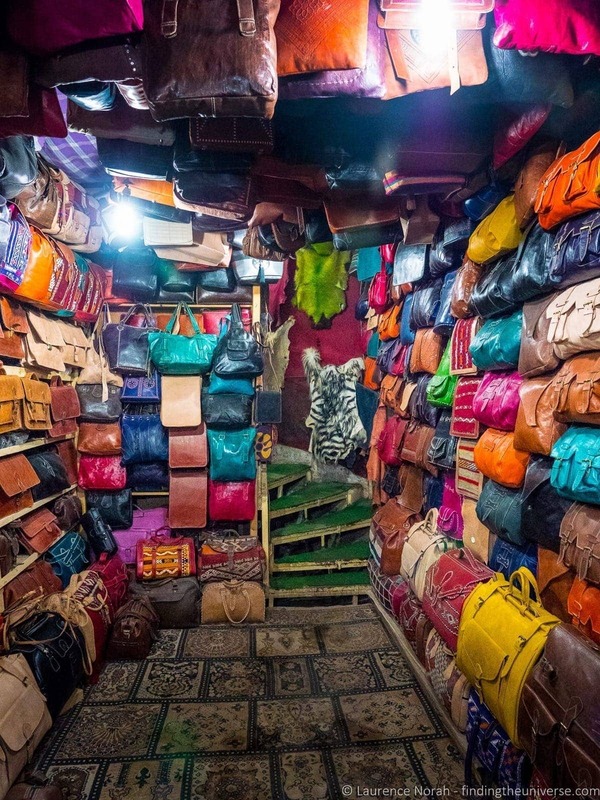 Then it was on to the world famous tanneries of Fez. Unfortunately, these are under serious renovation, after countless centuries they were a little the worse for wear. So we got to see a construction site, and a video of what they should have looked like. Having visited tanneries before, I wasn’t totally sad about this, because they smell awful when in operation! Still, I was a bit sad to miss the photography opportunity. gain, these were generally fairly soft-sell locations without too much pressure to buy, the quality and prices were reasonable, and certainly plenty of souvenirs were bought by folks on the tour! Then it was back to the hotel and dinner at our leisure. 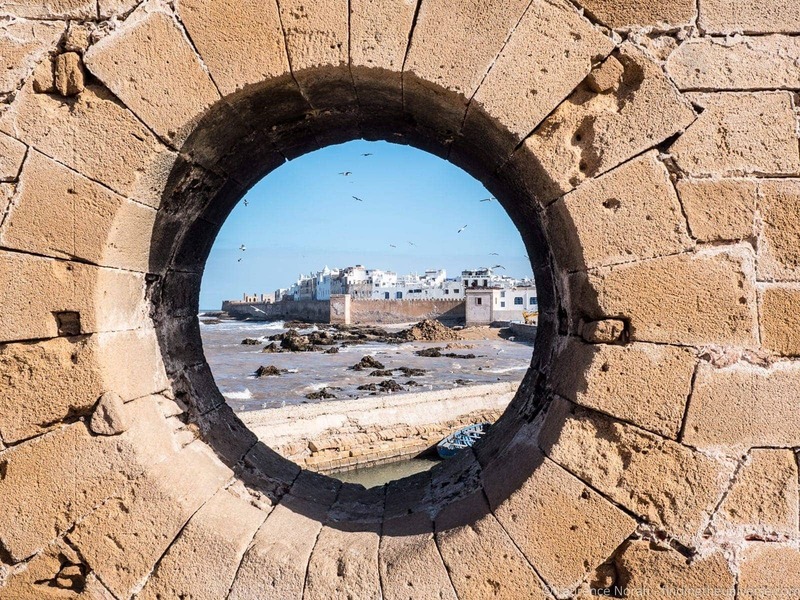 From Fez, it was another long drive, this time to the coast, with our destination being the city of Casablanca – made famous by the movie of the same name, even though none of said movie was actually filmed anywhere near Africa! On the way we stopped for a tour of Rabat, which is the capital of Morocco and another World Heritage Site. Here again we were taken for a tour with a local expert guide. This included a visit to the Hassan Tower, construction of which commenced in 1195 but which was never finished. Then, it was on to the Andalusian Gardens, the ruins of the Roman city of Chellah, before we finished our tour wandering around the gorgeously colourful Kasbah of the Udayas – filled with lovely blue and white walls, intriguing doorways and tiny alleyways. I think it’s fair to say we would all have been happy to spend more time in Rabat. Time, unfortunately, wasn’t on our side, as we had to head on down the coast to Casablanca, another long drive away. We took the scenic coastal route, and I did enjoy seeing the rural coastline, and how different it was from the mountainous and desert regions. 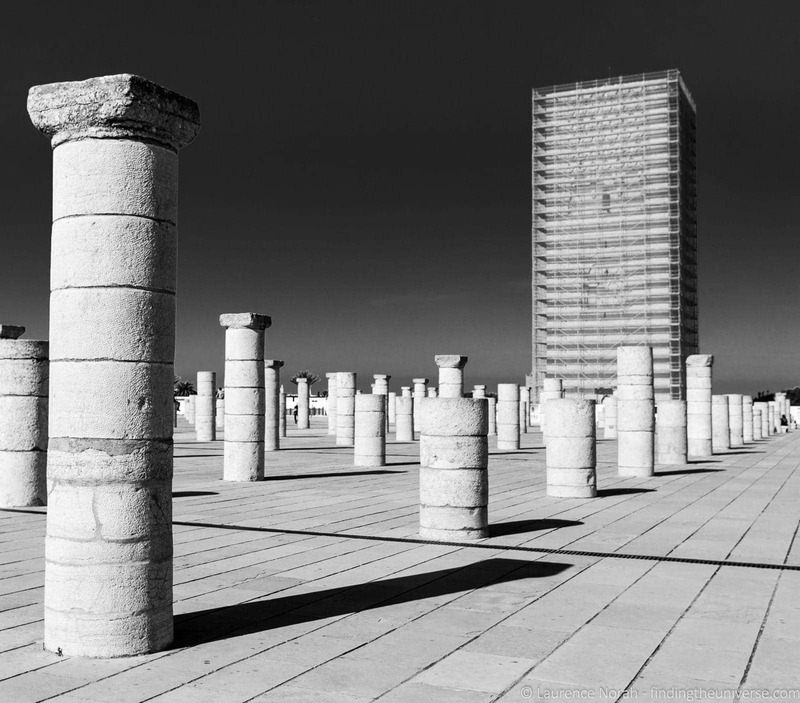 Finally, as evening was hoving into view, we arrived into Casablanca. Casablanca isn’t really as romantic as the movie made out, being largely a commercial port city, but it does have a impressive mosque. 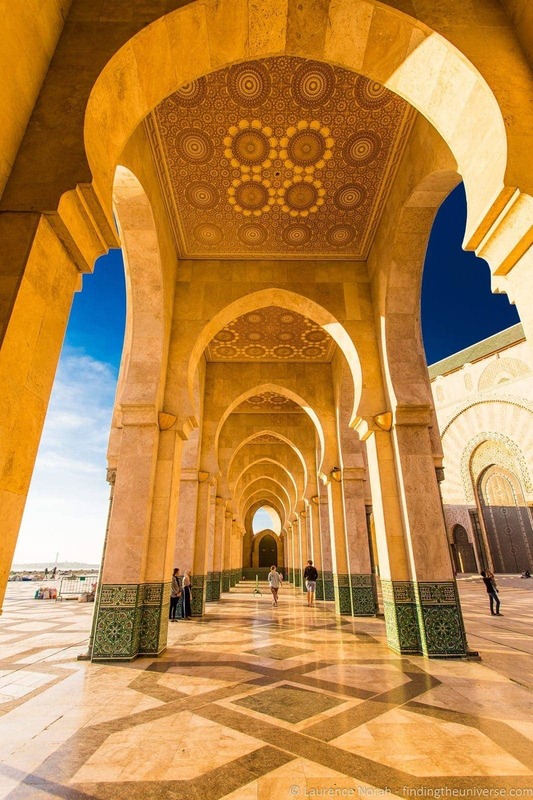 The Hassan II Mosque isn’t particularly old (1993), but it is the largest mosque in Morocco, the seventh largest mosque in the world, and it has the highest minaret in the world, at 210m. It’s also a convertible, in that the interior roof retracts to open the interior to the sky. It’s a rather impressive building, to say the least. We had an optional tour (fee) scheduled of it for the following morning, but as the light was so lovely, we had a chance to explore and wander a little as the sun set, where I was able to capture some jolly nice images. Then, it was back to the hotel, dinner, and bed. 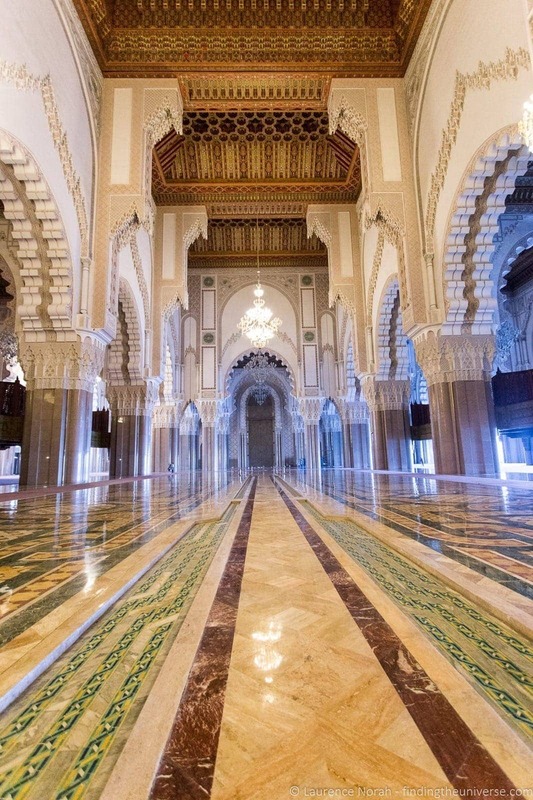 Casablanca started with a morning tour of the Hassan II Mosque. Like the majority of the activities we did, this was also optional, but most people chose to do it. It was very much worth it as the building is hugely impressive, and as I’d never been in a mosque before, I was intrigued to learn how they worked. 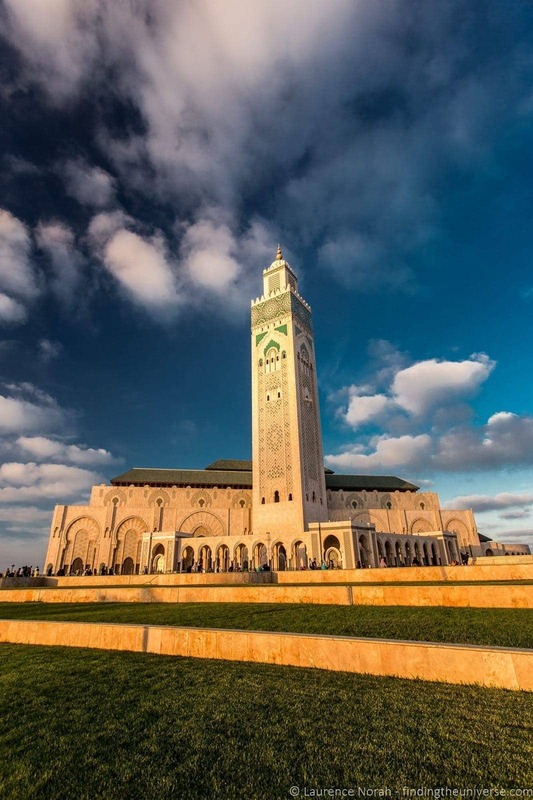 The guided tour was very interesting, and if you’re in Casablanca or on this trip with Travel Talk, I very much recommend making the time to do this. 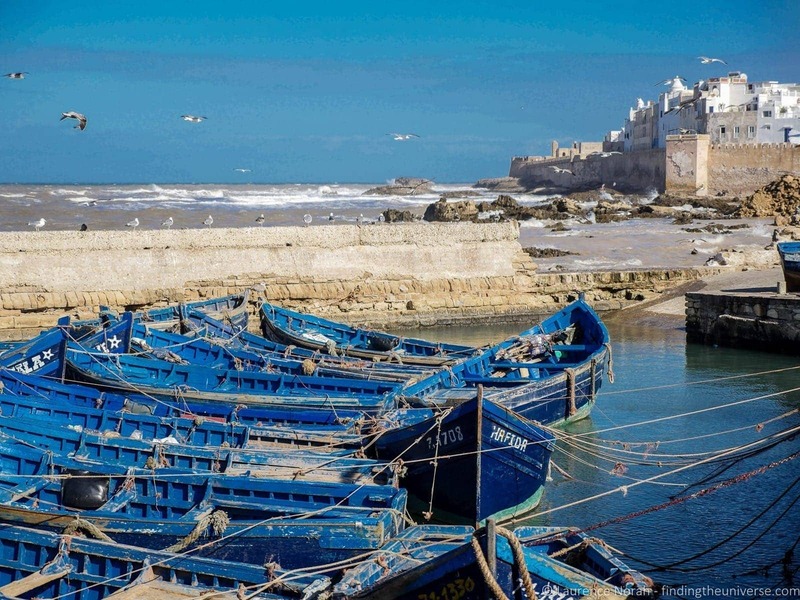 Then, we left Casablanca, and headed down the coast to Essaouira, another pile of driving away. We stopped for a delicious sea food lunch on the way, and arrived as night was falling. 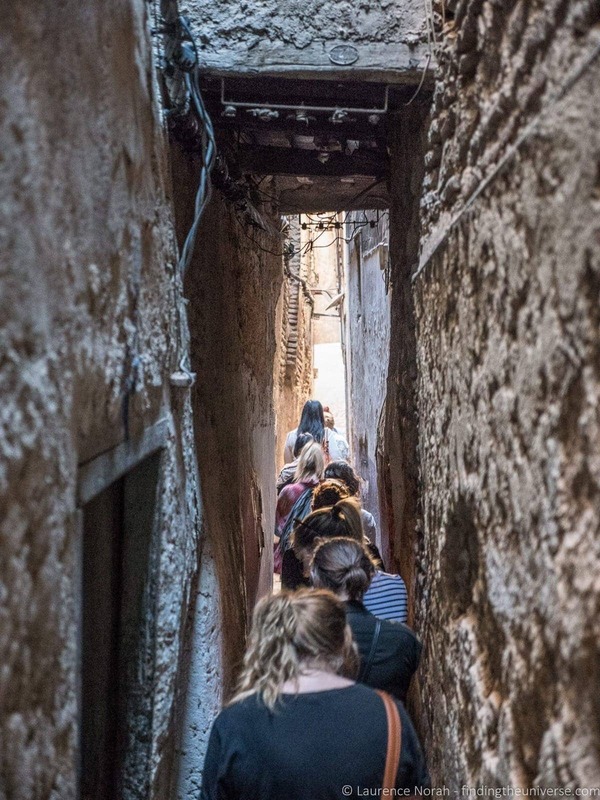 The hotel was about a 20 minute walk outside the city centre, but some of the group still took advantage of our guide’s offer of a walking tour, and spend some of the evening exploring the medina and old city. I have to admit that Jess and I were tired, so gave that one a miss, opting to explore it the following morning on our own. Our last full day of tour started off with a relaxing free morning, which was nice. We opted to spend it wandering into Essaouira, filming location of one of my favourite TV shows. After a twenty minute walk along the beach we arrived at the city walls, and I have to say, I instantly fell in love with this 18th century walled city. 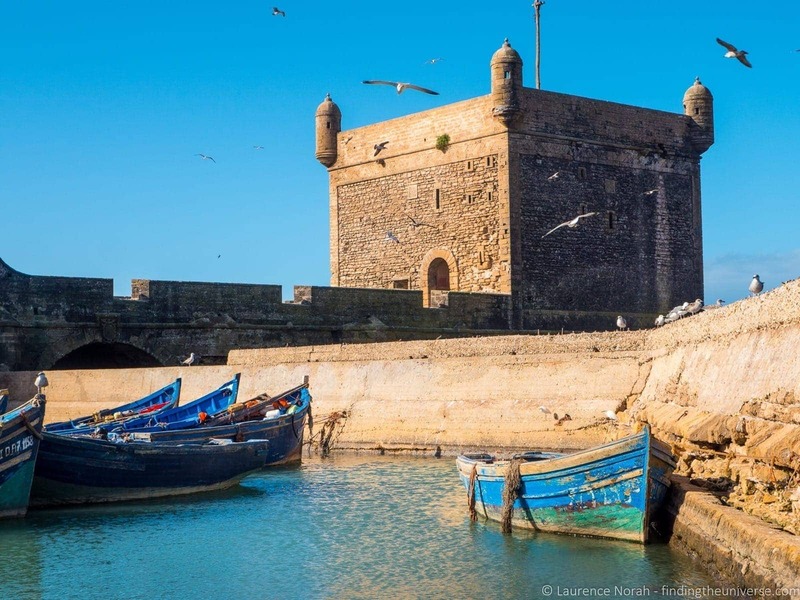 It just seemed like the perfect place to come and while away a few weeks, wandering the alleys, city walls and beach, whilst sampling some delicious Moroccan cuisine. Of course, we didn’t have time to spend a few weeks – just a few hours. We packed them full though – with a highlight being the visit to the Citadel – well worth the minimal entry fee for the views. Then, it was time to head back to the hotel, check out, and hop into the bus for the last journey of the tour – back to Marrakech! We stopped on the way for a tour of an Argan oil production facility. Argan is an oil from a tree endemic to Morocco, and naturally is said to have all kinds of exciting properties. We didn’t buy anything, but it was interesting to see how the oil was produced and to meet the people making it. Then, the last leg of the journey took us back to Marrakech, where we checked into the hotel. There was the option of a trip into the city centre that evening which we didn’t take, as we’d already spend a couple of weeks in Marrakech, and had a few more nights scheduled there before our trip to Egypt. Whew! Still with me? Not much to say about the final day – after breakfast everyone said their goodbyes, exchanged contact details (well, facebook friend requests) and headed on their way. Travel Talk includes airport transfers, so trundled everyone who was leaving back to the airport. A good few people had booked a couple of extra nights in town, which I would recommend doing as otherwise you won’t see much of Marrakech. 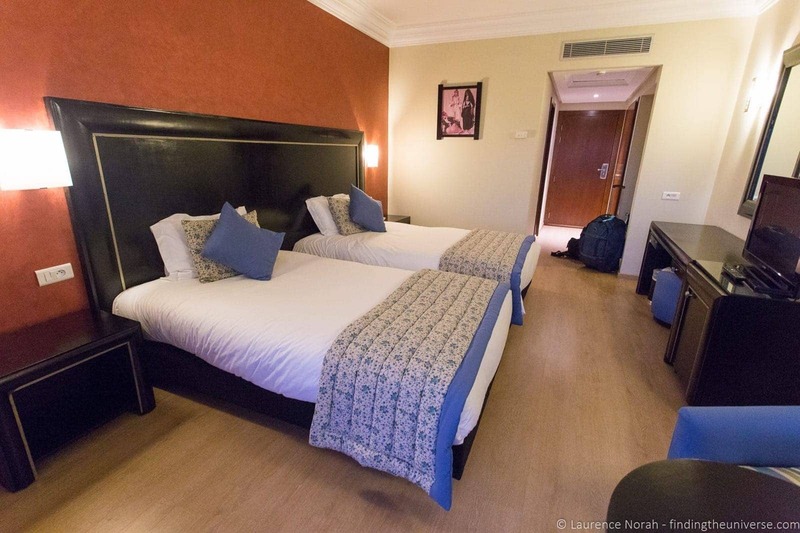 I’d also advise booking a guesthouse in the old medina part of town rather than where the Travel Talk hotel is located, as otherwise you’ll be journeying back and forth by taxi the 4km or so each way. 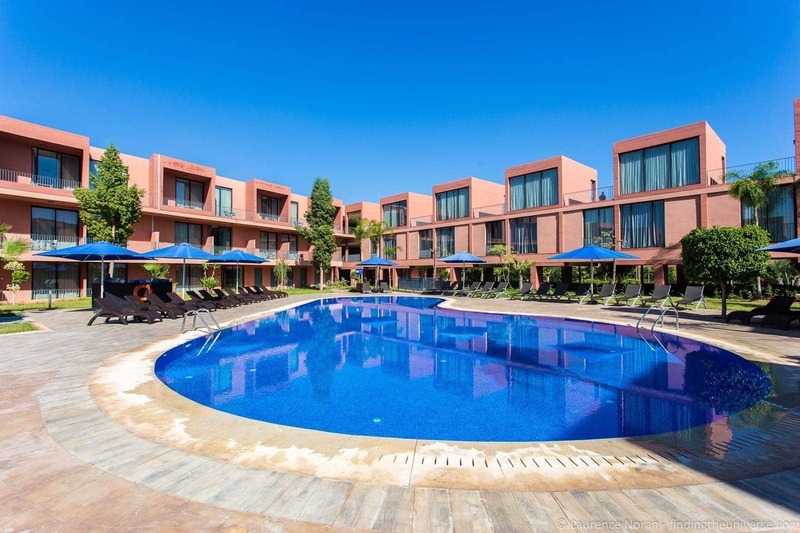 In terms of accommodation recommendations, we stayed at a centrally located basic Riad for three weeks, and there are plenty of options to choose from in Marrakech at all price points. So that was the tour in detail. Let’s go over my thoughts on our experience and see if this is the right experience for you. Covered a lot – As you can see from what we did, our ten day itinerary really packed in a lot. We saw everything from deserts to mountains to beaches, cultural highlights and adventure activities. 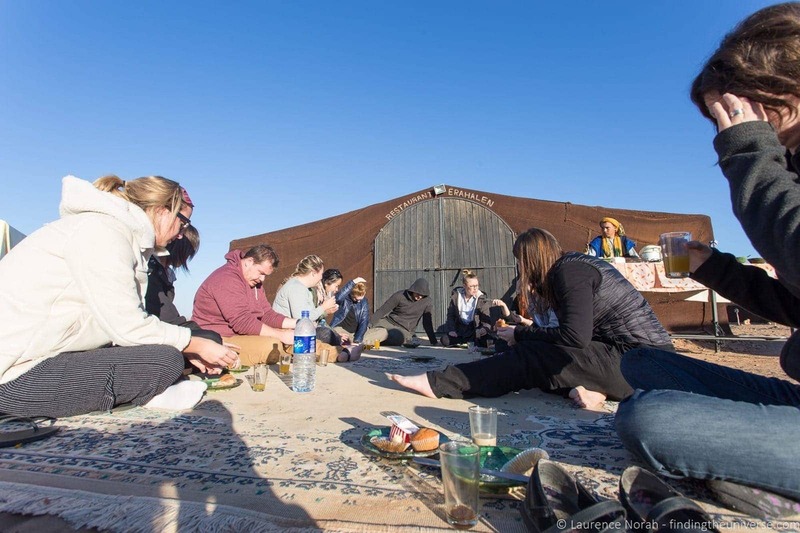 It was a fantastic way to easily experience a lot of Morocco in a relatively short period of time. Great people – A tour like this can be made or broken by the people on it. In our case (and on both our tours with Travel Talk in fact), we had lovely people, many of whom have become friends – in fact one will be visiting us in Scotland soon! 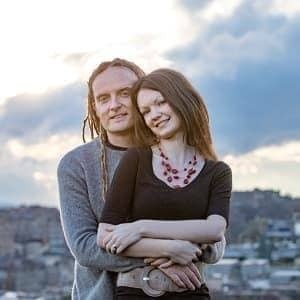 We had a lot of laughs and a lot of fun together on our ten day adventure, and I got the impression that Travel Talk tours tend to be like this as a rule rather than an exception. 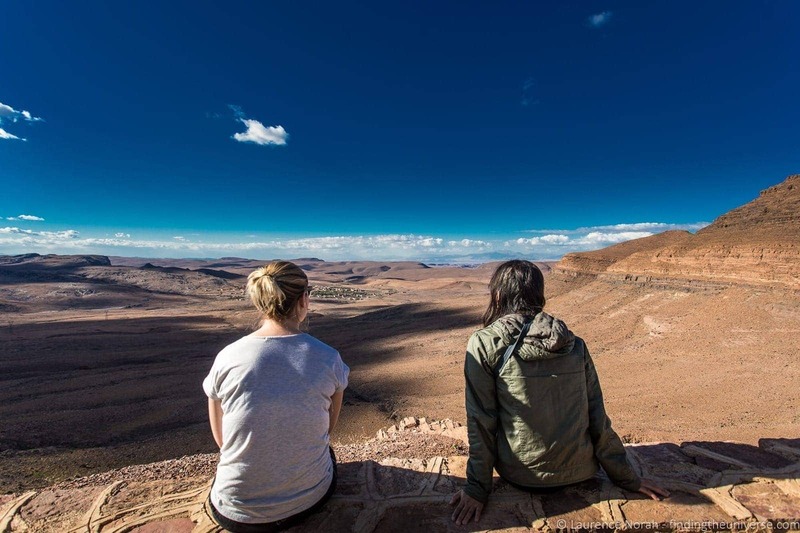 Easy way to see the country – It’s obviously entirely possible to do a trip like this on your own, plan it all out yourself, go at your own pace and so on. 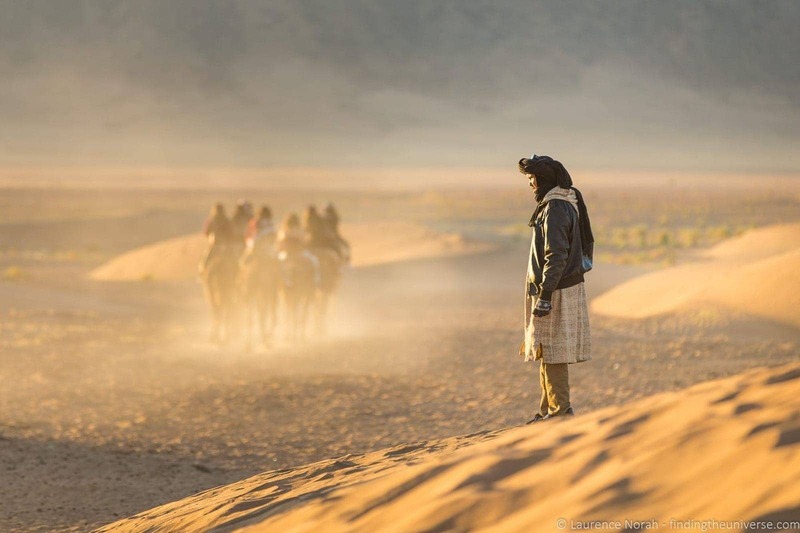 For a first time visit to Morocco though, this could be a bit of an overwhelming amount of work, and the Travel Talk tour removes all the hassle. You see all the highlights, hang out with great people, have a lot of fun, and don’t have to worry about anything other than making the bus in the morning. Too easy. Decent accommodation at the price – One thing that really impressed everyone on the tour was the quality of our accommodation. Aimed firmly at the backpacker market, the hotels we stayed in were a far cry from the hostels that many were used to. Sure, you’re not going to be staying in the Ritz, but the hotels were all nice three and four star properties with good beds, high cleanliness standards, private bathrooms and so on. No-one on the tour had anything bad to say about the accommodation. Friendly, knowledgeable guides – Our guide Mustafa was very friendly and certainly knew a lot about the history of the country. On those long bus rides, he’d often get up and chat to us about where we were driving, what we were seeing, and the history of the country. I have to confess, Jess paid more attention to this than me, I was happy to just let the scenery wash into me. Value – Everyone we spoke to on the tour was very impressed by the value that the trip offered – we saw a lot, and as mentioned above, the accommodation was of a good standard. It is worth mentioning that the sticker price on the website is not the final price. 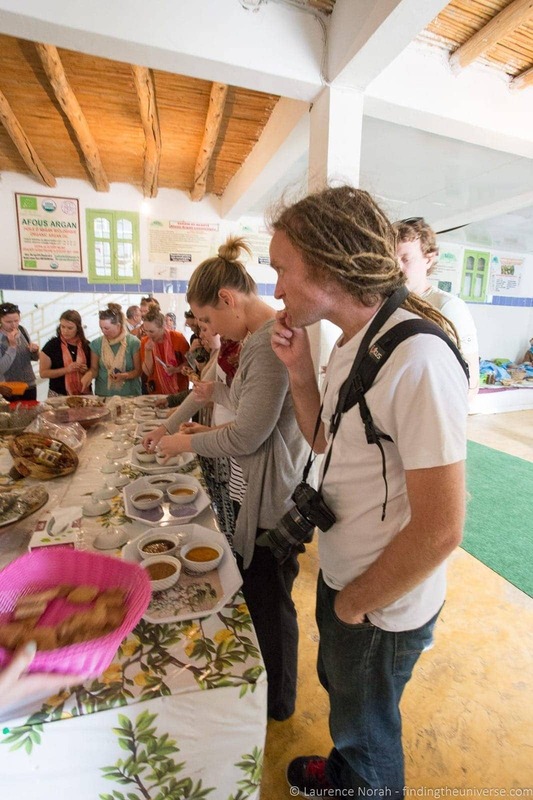 There is a local fee that will be charged at the destination (collected the first night so have it ready after you arrive) and not all meals or activities are included in the price you pay prior to joining the tour. Travel Talk certainly don’t hide this – it’s really obvious on their website what is and what isn’t included in each tour. Generally, you need to budget in entrance prices, some meals, any optional activities, and tips on top of the advertised price. 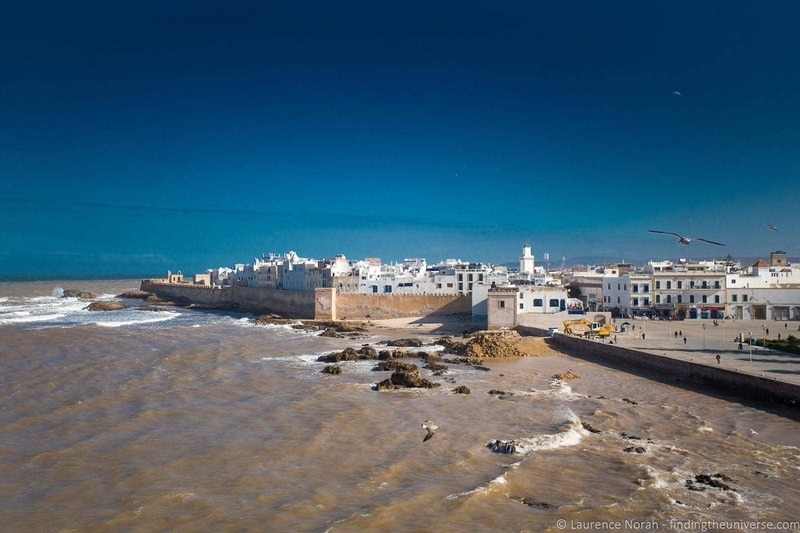 Each tour on the Travel Talk website has guidance for how much you might need to budget for these – see here for the Exotic Morocco example. Then, also consider drinking water, alcohol, snacks, and gifts to come to a final budget. I think the trips are excellent value for money, just make sure you do your sums first to be sure they are right for you! WiFi access – There’s no WiFi on the bus, and the majority of the hotels we stayed at only offered WiFi in the lobbies. Usually this was fast enough for social media and e-mail, but I wouldn’t suggest you’d be streaming movies or uploading video. In some cases, we couldn’t get it to work at all. I expect over time this situation will evolve, but for now, be prepared not to be in constant contact with the world. Not a terrible thing really. 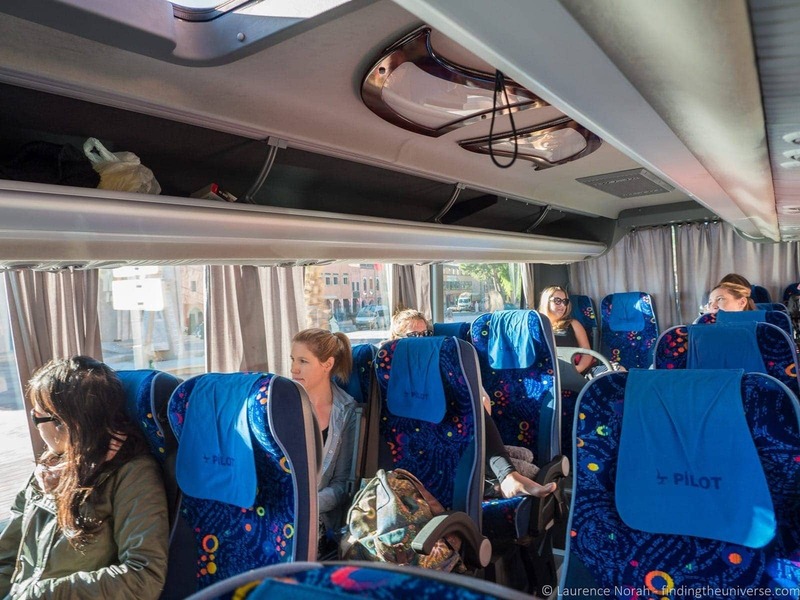 Long bus rides – As you’ll have noticed from the overview of what we did, we spent a lot of time on the bus. Like, a LOT of time. The bus was comfortable, and the driver and roads were both excellent, so it never felt dangerous, but it did go on for a while on some days. 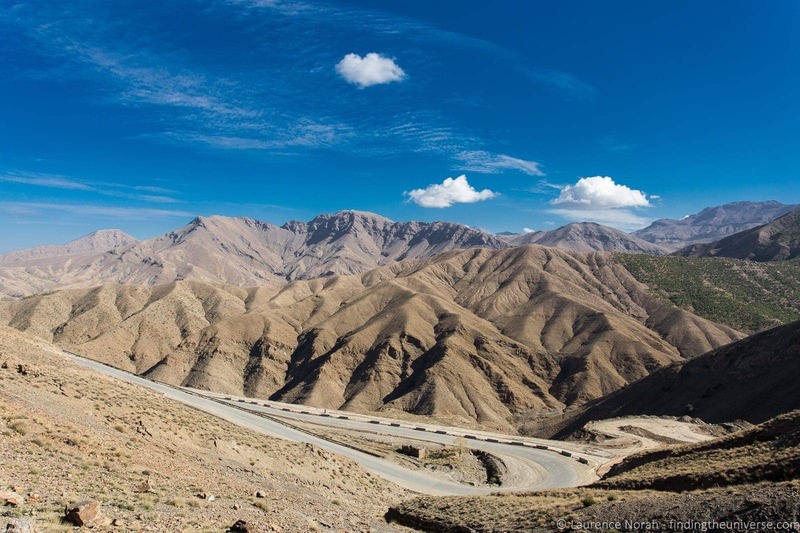 The plus point to this is that we saw a lot of Moroccan scenery, which was absolutely stunning, particularly in the High Atlas and Desert sections of the tour. There were also lots of stops for photos (and to buy water / use the loo), as well as loads of information from our guide about what we were seeing. If you’re happy to gaze out of a bus window for hours on end, you’ll not have a problem with this. Otherwise, consider loading up your device with movies, bring a well stocked Kindle, or prepare to become best buddies with everyone on board! Free time – We didn’t have a great deal of free time scheduled in to our trip, unless you opted out of some of the activities. We did have plenty of time on the bus of course, but exploring on our own was a bit limited. My advice would be to add on a day or two in Marrakech at the start or end of the trip if you want to see more the city, as the tour spends a minimal amount of time in the city, and there’s more than enough to do in Marrakech to fill a couple of days of sight-seeing and shopping. 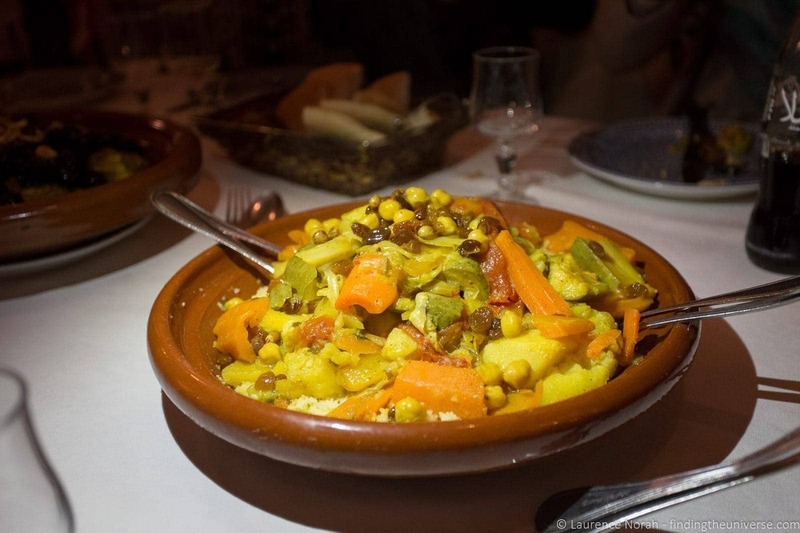 If you’re looking for more ideas on what to do in Marrakech, check out this post from Jess, highlighting 12 must do’s in Marrakech! Morocco, being a Muslim country (if fairly liberal) isn’t known as exactly a party destination. Our group was made up of 16 people (Travel Talk Tours can be up to 30 in size), with lots more women than men – there were three guys travelling with their girlfriends, including me, and then the rest of the group were either solo female travellers or groups of girlfriends. Ages ranged from mid-twenties to early thirties. 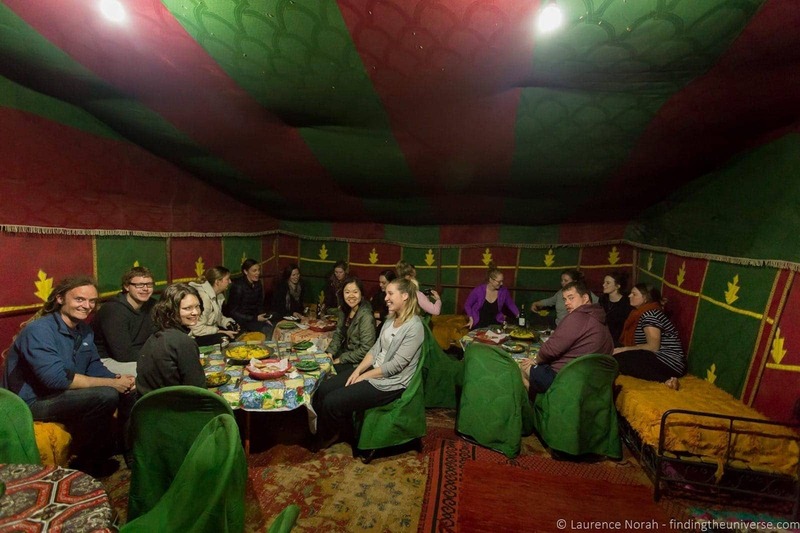 Nationalities wise, there was a heavy skew towards Australian, with Travel Talk tours generally popular amongst Australians and New Zealanders – our guide confirming that the gender split, age range and nationalities in our tour were pretty standard for their Morocco trips. So just know that you will probably be on a tour with a group of 20-something Australian women. Morocco is a safe country to travel in. The main issues are health, in terms of keeping an eye on what you eat and drink, and the occasionally aggressive nature of some of the vendors. In the latter case, this might be from street performers demanding you pay them an extortionate amount for the photo you snapped of them or someone who offers you a tour of the tanneries, followed up by some aggressive tactics to make you part with your cash. My advice would be to have some change available to pay vendors if you do decide to take photos, and to stick to only organised tours with a pre-agreed price for the activities. You’ll be largely insulated from the hassle on the Travel Talk tour, although some of the shops that the tour visits do feature some fairly persistent vendors. Just remember that they’re trying to make a living, and if you do want to buy, nearly every price is negotiable. 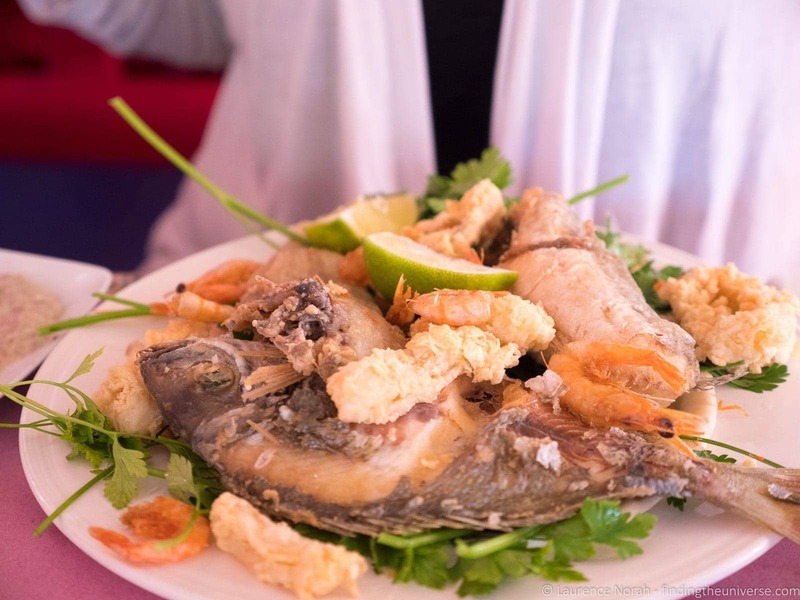 For food and drink, similar rules apply to travelling in a good many countries – only drink bottled water, steer clear of salad and fruit that hasn’t been peeled, be wary of ice cubes (it might not be bottled water) and only eat food that is well cooked and served hot. Check out this guidance for more info on staying healthy abroad. Personally I didn’t get sick on the trip, but I travel a lot, and my stomach is pretty good at handling different types of food. Many of the folks on our trip did get upset stomachs, diarrhea and the likes at some point in the tour, which is pretty much par for the course when travelling in areas like this. Pack hand sanitiser and Imodium, or pop into a pharmacy when you’re in the country – there are plenty on hand, and they are more than used to handing over the right kind of pills to travellers in need! If you go in the hotter months, stay hydrated, and be aware of the signs of dehydration – which can often manifest as food poisoning. 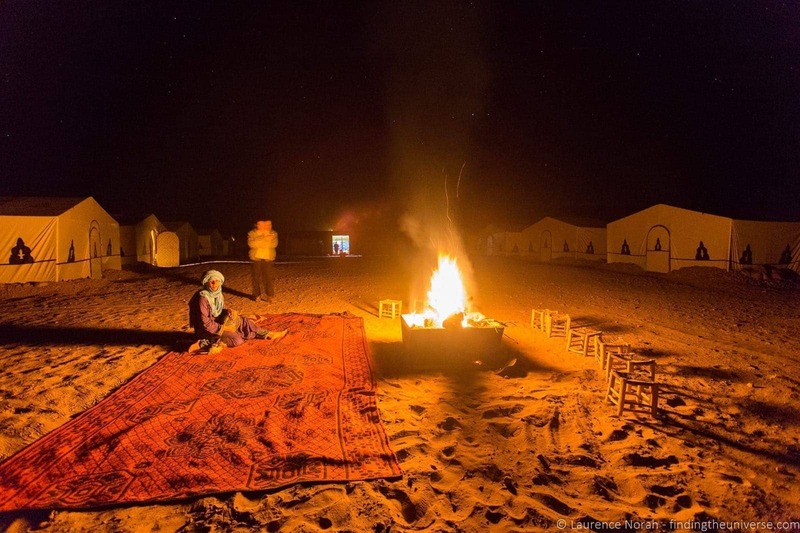 Situated in North Africa, Morocco gets incredibly hot in the summer months (40C+), and quite cool in the Winter months, particularly at night and higher altitudes. There’s even skiing in the Winter. The best time to visit therefore is generally the Autumn and Spring time, when daytime temperatures are in the mid twenties, and it’s cool enough at night not to need to use air conditioning. Pack layers as sometimes it can be a bit cool at night, especially in the desert and in the higher mountainous regions. Of course, I can’t answer that exactly! Hopefully you’ve got an idea of whether or not it is based on the post above. 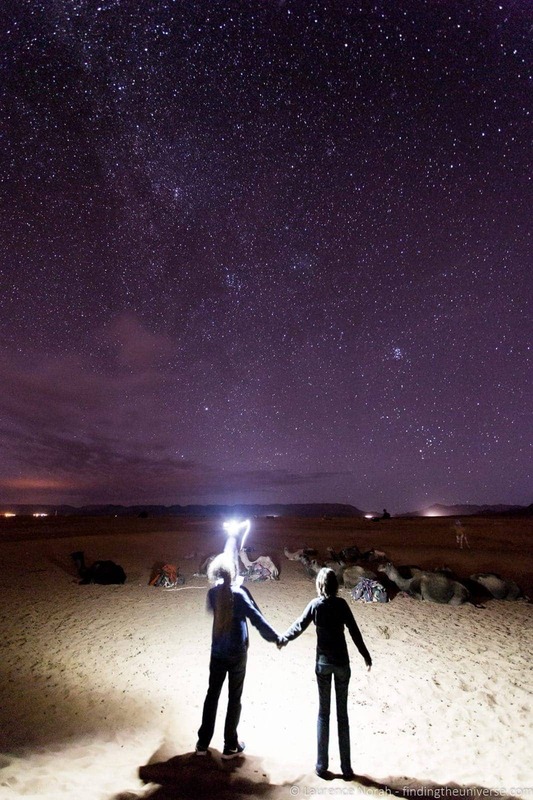 I would say that if you want to see a good amount of Morocco, have a safe and fun trip with good people that also happens to be great value, then yes. Of course, if you’re not into group tours, this won’t be for you. Travel Talk also generally has an age range of 21 – 35 on their tours, although our guide said that they have had all ages, so if you’re young at heart this would work for you too! One thing that did stand out as a positive was that many of the folks on the tour had been on Travel Talk tours before, and were planning to go on them again. Clearly the company is getting it right on their tours for their audience, which is a great sign. Finally, this wasn’t a “party” tour.Whilst alcohol was available at the hotels we were at, and stops were made to give us the option to purchase it (for example before heading into the desert), the long days, early starts and full schedule meant that whilst people might have had a beer or two (or some fine Moroccan wine!) in the evenings, there weren’t any late night party sessions. Of course, this might vary based on your group, but again, indications from the guide were that this was very much the exception. 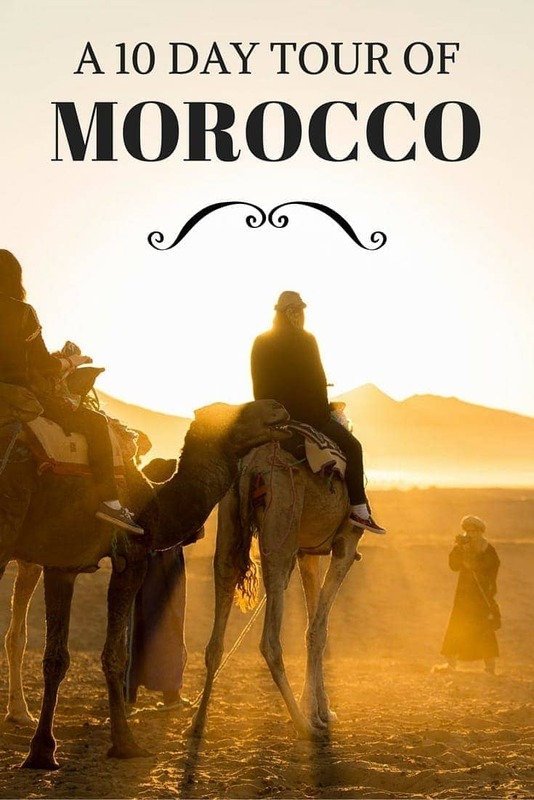 This travel guide to Morocco, for something to read and get you excited about on the plane ride over! And that’s it! Have feedback or thoughts on the above? Let us know in the comments below! And that summarises our experience travelling Morocco with Travel Talk! Have you been to Morocco? Been on a tour with Travel Talk? Share your experiences in the comments below! Our tour with Travel Talk in Morocco was provided to us compliments of Travel Talk, who covered our airfare to and from Morocco, all our tour expenses, and most of our meals during the tour. All opinions remain ours – check out our code of ethics for more on that that works. My friend and I will be traveling from Toronto to Morocco in mid-February. We are so glad we came across your post. This really helped us decide if we want to do the trip or not. With the recent travel advisory do you think it’s still safe to travel to Morocco ? So, there are very often travel advisories in destinations. In our experience, whilst they serve a useful purpose, they tend to be fairly broad brush, so it’s just a question of what you personally feel comfortable with. 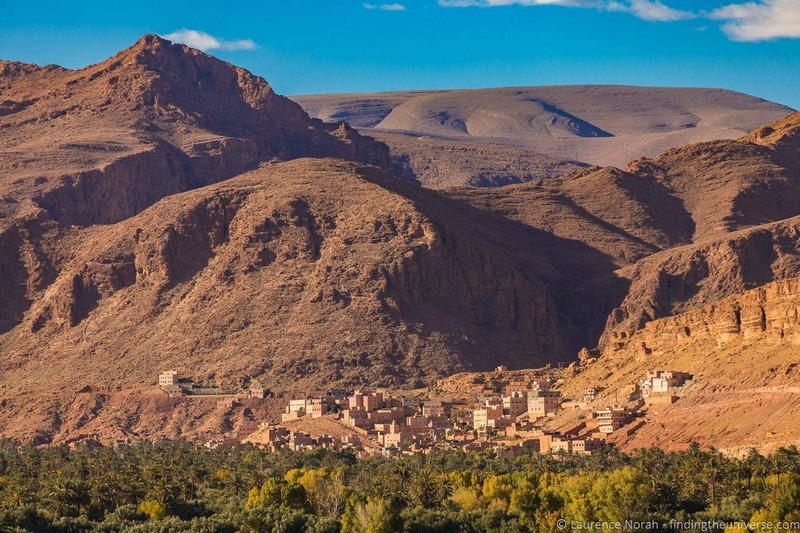 Currently I would personally see no reason not to travel to Morocco, but I can’t of course promise you that it’s a safe destination – nowhere truly is (even home!). So it’s always a personal decision. I think it’s safe yes, no less safe than the majority of destinations around the world, but that’s just my thought. Thank you so much for the blog post! Part of the reason I ended up booking was due to it. I leave in a few days and im very excited! I was wondering if you had a rough budget/general idea of how much you spent while on the tour? I can’t seem to find one from Travel Talk, and I’m just trying to sort out how much I should bring. Just a rough estimate would be great! So, your main expenses will be your Travel Talk local fees (the exact amount should be in your booking,/pre-departure info), money for entrance fees to each paid attraction or museum you wish to visit (the amount for each should be in pre-departure info), and any money for any optional activities you wish to do (options and prices should be provided, these are normally booked the day you arrive and meet your tour group and leader). The rest of your budget would be money for meals that are not covered (meals are relatively inexpensive in Morocco , you can normally eat for 5 to 10 USD we’d say), extra money for snacks/souvenirs/gratuities/extras (many public toilets have an attendant/cleaner present that you should tip a small amount). 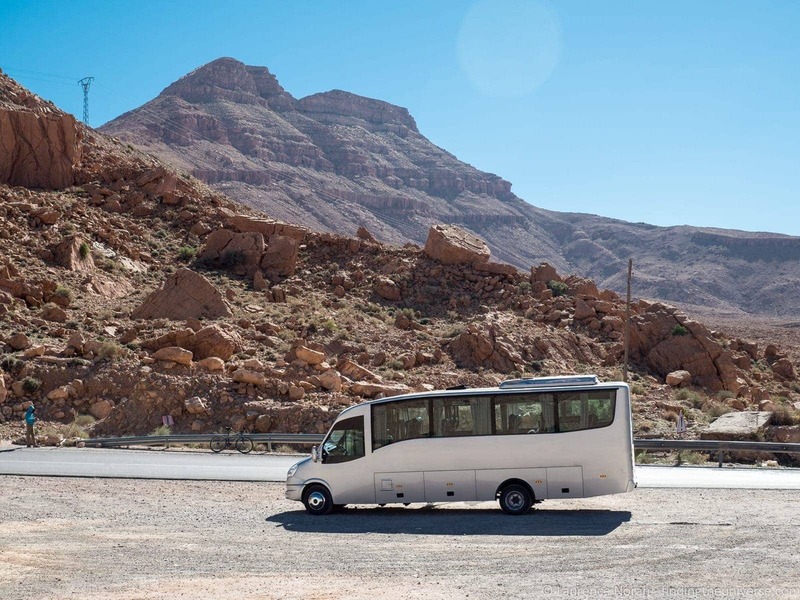 On one of the last days of the trip, the group will collect tips/gratuities for the driver and tour guide (this is recommended but optional, and you can give what you wish). We did not spend a lot of money in Morocco but some of the people on our tour bought a lot of souvenirs, goods, snacks, etc., and you decide if you want to do optional activities or not so you do have quite a bit of control over your budget. We’d also add that near the start of the tour there were some stops so folks could stock up on drinks and so on, which is a good budget option. Have an awesome trip, and do pop by when you are done to let us know how it was! Excellent Blog! very helpful … and the links were informative! My husband and I are going on the Exotic Morocco tour in July. We were wondering about when and where to get cash. Should we get a large sum at once? or smaller portions along the way? Also, does the dessert get cold at night in July? We want to pack light and just wondering about the best type of clothing to bring. Thanks for your help! We felt very safe on the tour so you should be fine to get a fair amount of cash, but the guides will tell you at the beginning of the tour as to your options for where you can withdraw cash so you can plan accordingly. We were there a little later in the year than July so it was a bit cool in the evenings, but the tents came with blankets. I have to confess I’m not sure exactly how cold it would be – I’m guessing not freezing, but possibly a bit cool, so maybe bring some warmer layers to be on the safe side. And do please pop back once you’re trip is done so I can update the post! Thanks ever so much for your detailed blog, it inspired me to sign up and I am now going solo trip next month. 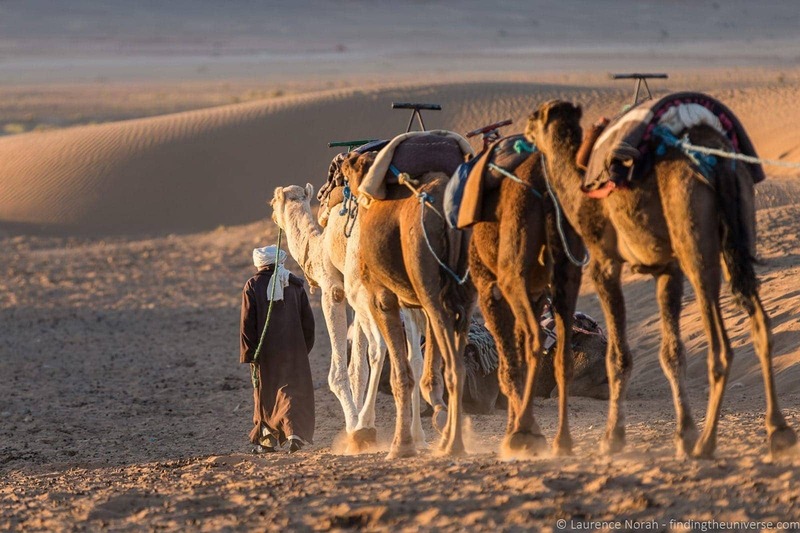 I have read many reviews that it helps to arrive a day or two ahead of the tour to explore Marrakesh. What would be your must-see places and what was your average budget per day? I plan on purchasing my first professional camera, what would be suited for Morocco as a beginner? In terms of budget, it’s not a very expensive place, I’d say you could easily get by on £20 – £40 a day. If you read that and still have questions, I’m happy to help of course! Hi Simona! 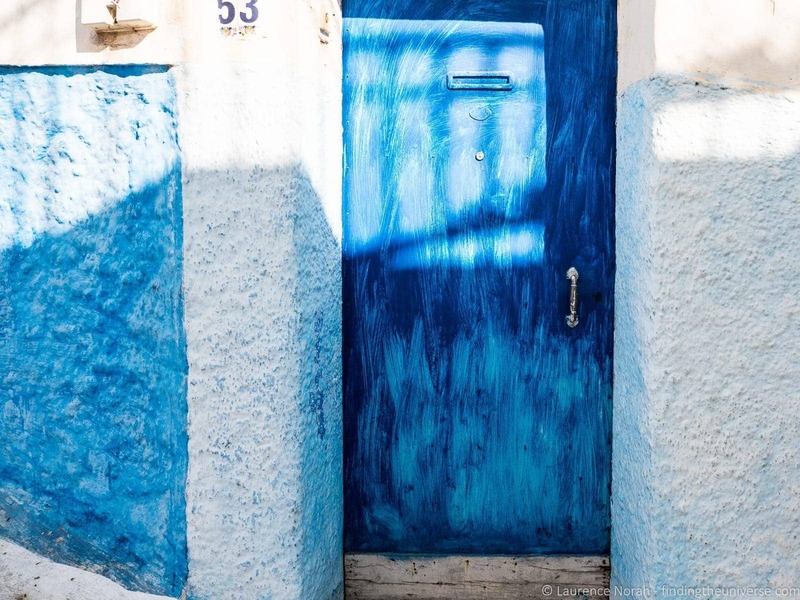 The tour we did, titled Exotic Morocco, did not go to Chefchaouen, however, looking at the itinerary, this tour does seem to have been updated and now includes Chefchaouen. For the payment, Travel Talk splits the payment into two parts – one part that you pay up front, and one part that you pay locally when you arrive. This is made pretty clear when you book, and is listed as the tour price and the local payment. So you pay the tour price on booking, and the local payment on arrival. Hope this helps! Thank you very much for clarifying and for inspiring me to choose them for the Morocco tour! My pleasure – have a great trip!